It pays to plan ahead! 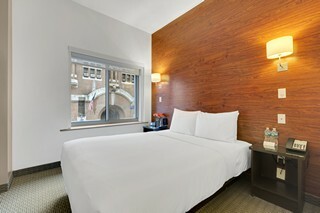 Book your stay at the hotel in advance and save 20% off best available rate. Policies: Reservation may not be cancelled or modified and is non-refundable if cancelled. The full amount of your stay will be charged to your credit card at the time of booking. Guarantee Policy: A non-refundable deposit equal to 100 percent of your total stay is required at the time of booking and will be charged to your credit card. Our elegant Accessible Cozy Queen with tub offers a spacious room with one queen size bed. All accessible tub rooms feature grab bars, a door clearance of 35 3/4 inches wide. The contemporary Swedish design was planned with functionality and comfort in mind. 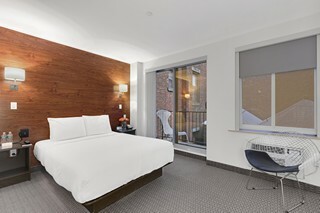 Relax on our plush pillow top mattresses covered with fine linens and refresh with Revolve bath amenities. 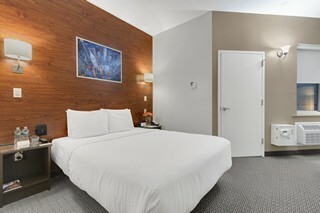 Each room is equipped with a comfortable work desk and chair, 40” flat-screen LCD HDTV, Bluetooth ihome alarm clock radio, high-speed wireless internet access and two bottles of water. Our ravishing Superior rooms feature a queen sized bed with lush Royal Suites linens, a spacious balcony, a functional work desk, and a sleek black tiled bathroom that accommodates a shower tub and complimentary ReVolve toiletries. High speed wireless internet access and a 40 inch flat screen cable TV are just some of the room amenities that we have to offer. All are non-smoking and pet-friendly.